prep and point of sale areas. empirical reverberation time in the concerned area. The Alphaseptic Ceiling System reduces clean room noise and reverberation while enhancing visual acuity and sterility. The need for sound control in food, drug and beverage production areas as well as hospitals and clean rooms is especially demanding because all surfaces must meet rigorous sanitary standards. 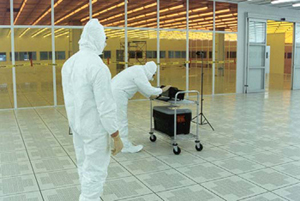 Each surface must be easily cleaned and environmentally stable. Alphaseptic lay-in ceiling panels meet these requirements while absorbing up to 95% of the noise (noise reduction coefficient of up to 0.95). Extensive research has developed a superior method of totatally encapsulating a panel of compressed, sound absorbing material in a PVF membrane. The PVF membrane is a rugged material that is inert to common solvents, acids, greases and sanitizing chemicals. It is easily cleaned with ordinary cleansing agents. It remains tough and flexible from -100°F to 225°F to absorb almost any form of impact without physical degradation. 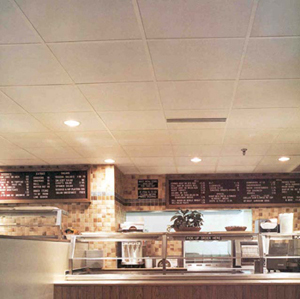 Alphaseptic acoustical ceiling panels will provide years and years of service without cracking or peeling. They have received the U.S. Department of Agriculture's approval as a component of ceilings and walls in meat or poultry preparation areas. Our unique method of totally encapsulating the acoustical material assures a complete seal to prevent fiber migration. Alphaseptic panels fit into standard suspended grid ceilings. Standard sizes are 24″ × 24″ and 24″ × 48″. Special sizes are also available. Where fitting and trimming is necessary, we provide border panels of 1/2″ gypsum board with the same PVF membrane covering. This allows a uniform ceiling finish while providing superiro sound absorption in areas where acoustical materials could not be previously used. Additionally, Alphaseptic Ceiling Panels may be used as functional absorbers or as encapsulated media in Alphaloc Silencers for fants, blowers or HVAC systems. Application engineering is available. The addition of ALPHASEPTIC Ceiling Panels creates a 13.08 Decibel reduction.